Launceston Brush Company | Launceston Then! 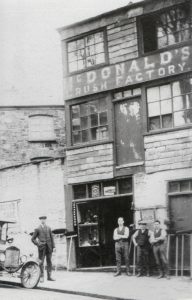 The Launceston Brush Company started out as McDonald’s Brush Factory at 1, Western Road. Later it became McDonald & Pyatt’s Brush Factory. After the Second World War it became the Launceston Brush Factory transferring to the old United Methodist Chapel on St. Thomas Road (New Road) under the managership of Stewart Fitze, the son of former mayor, Sydney John Fitze. It was taken over Cimex International, Ltd. who, in 1965, decided to close the factory down, moving it to Kent. The premises were then taken over by the Bridgend Case Company, Ltd., who panned to manufacture wooden transport cases. Post & News, 4th December 1965. Launceston Brush Factory To Continue – But Cases Will Take Over From Brushes. As we reported some weeks ago, the brush-making factory of Cimex International, Ltd., is to be transferred to Kent by the end of the year, a move which has caused some local misgivings at the loss of industry and employment to the town. Now the “Post” learns, exclusively and authorotively, that the premises themselves in New Road will continue to be used for factory purposes. Messrs. Cimex are due to move out by December 25th, the quarter day, and it is good news for Launceston that from the following day, Boxing Day, the premises are being taken over by the Bridgend Case Company, Ltd., and will be known as Works No.3 of that company. The firm will be employing all the men at present in brush manufacturing, and hope to be able to consider employing the female staff at a later date. The office staff will also be retained.. The Bridgend Cases are manufacturers of patent knock-down cases made explicitly to customer’s requirements for the transport of good; indeed they will undertake to pack anything for anybody, a service which should be of interest to firms with export interests. The cases are of wood, not cardboard, and the company also makes birch fencing and such items as timber discs for brush-heads. Indeed, in this respect they already have a connection with Messrs. Cimex, who have just awarded them a further contract for the discs, so the New Road premises will continue to play some part in brush-making. The factory premises still belong to Freeman S. J. Fitze, and will be on lease from him to the Bridgend Case Company. 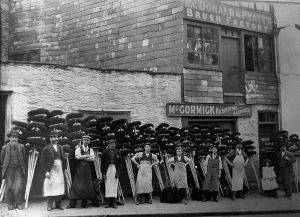 However, this wasn’t the end of brush manufacturing in the town, because rising like a phoenix, a new venture began run by Messrs. Hodell, Ltd. a company formed by Mr J. D. Hodgson, Mr W. R. Bickle and Mr Ellis. The new company started up in premises not far from the old one on St. Thomas Road, below Gable’s workshops in Dockacre Road. Post & News, 18 December 1965. New Brush Factory – Starts in Launceston as Old One Closes. Further welcome news for Launceston, following our announcement that the brush-factory premises at New Road being vacated by Messrs. Cimex, Ltd., are being taken over by the Bridgend Case Co. Ltd., if the fact that a new brush factory is now being set up in the town. The new company will be using premises below Messrs Gable’s new building in Dockacre Road, and these are now being fitted out for use as a brush factory. There will not be a great deal of mechanical installation, as the work being undertaken is mainly hand-work and biggest cost, we understand, is in labour. Already arrangements have been made for a proportion of the production to be exported to Canada. “We are starting in a small way at first,” a spokesman said, “But we hope to with energy to make the business grow and to create work for local people. This is what we are trying to do. We have offered jobs to ten girls, to start after Christmas, and we are hoping to employ twenty by next September.